The advent of modern technology such as computers has enhanced deaf education by making teaching and learning more interesting. 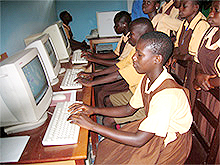 FHI’s recent establishment of a computer laboratory at Cape Coast School for the Deaf (in collaboration with the Royal Netherlands Embassy in Ghana) is helping deaf students move into advanced studies in Information Technology. The students, though deaf, can now learn what is going on worldwide and exchange global information through the Internet. They feel proud for being able to integrate well into international affairs, which enables them to effectively contribute to global development. FHI is committed to continue sourcing IT equipment for the education of the deaf, blind, crippled and the mentally handicapped. Can you help donate IT Equipments such as computers, etc.? Then click here to fill a form.